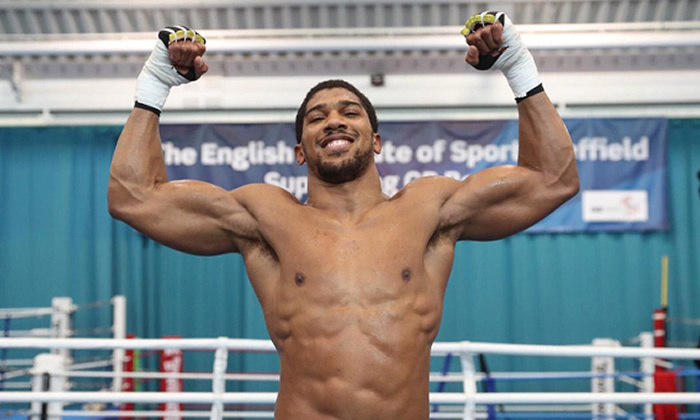 Anthony Joshua’s family in Sagamu and youths in the town have said they want the British-born boxer to become the greatest boxer in the world. Joshua defeated Alexander Povetkin in the seventh round to defend his WBA, IBF, WBO and IBO heavyweight titles at the Wembley Stadium in London on Saturday. He is in line to fight the winner of the December 1 bout between WBC title holder Deontay Wilder and British boxer Tyson Fury in 2019. A victory in the fight will match Joshua the undisputed heavyweight champion. Joshua’s uncle Adedamola told our correspondent on the telephone on Sunday that the family would continue to support the 28-year-old in his quest to become the undisputed champion. He said, “We are happy that Anthony was able to defend his title against his opponent. We are grateful to God for his successes and that our prayers were answered. We know that with this win now, it is going to get tougher because Anthony is on the road to do what no one has done in the category he boxes in. “The next fight will be bigger than this but we won’t cease in our prayers for him because we believe that prayers work. We will continue to support him because we want him to be the best and greatest boxer in the world. We learnt that there are a few more fights before he can achieve that goal and we will keep supporting him as he moves in that direction. Spokesman for the Sagamu Youths Congress Ayodele Osho said the body was happy with the success of the fight, adding that the body believed that the prayers of Joshua’s supporters were answered with the victory. Osho said, “Victory comes after a lot of hard work has been done but there is also the element of luck, which comes from prayers. We believe in answered prayers and we believe prayers assisted Joshua to get the win over Povetkin because the fight could have gone either way.